We have been given everything that pertains to life and godliness (2 Peter 1:3). Many Christians today want to make the Bible relevant when it is already relevant. The word of God has something to say about everything. Where the Bible doesn’t address things explicitly or directly, it addresses implicitly and in principle. Also, God has graciously given us the Holy Spirit, who opens up the eyes of our heart to illuminate the path that the word of God has provided to keep our feet from stumbling. Most certainly then, the Bible speaks about productivity. As Mr. Spurgeon notes in the quote above, the Bible says much about how to be faithful with little so we can do a great deal of work in our life. The proverbs give us wisdom on how we should work. In the New Testament, Jesus calls us to faithful stewardship over what we have been given and Paul challenges us to be excellent in our work (Colossians 3:23-24). God is the only being in the universe who has accomplished everything on his to-do list. Being made in the image of God, man is drawn to a productive life but struggles to be productive because of sin. It is because of this that productivity gurus such as Peter Drucker, David Allen, Stephen Covey, and Tim Ferriss have the massive audiences that they do – productivity is critical and we need help. The aforementioned men have written invaluable books. A more invaluable book is Matt Perman’s, What’s Best Next. Perman rests on the shoulders of those who have gone before him and gives us a godward approach to productivity. 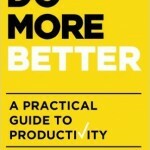 His book is for anyone who wants to get things done. However, Perman is inclined towards those involved in knowledge work and the realm of ideas. 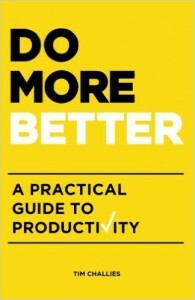 So, where Perman leaves off, Tim Challies takes off and writes a shorter, focused, and more practical (and much needed) productivity book, Do More Better. Why should you read this? God calls us all to a productive and faithful life. Challies is a renowned blogger (www.challies.com), writer, public speaker, elder, husband and father. He doesn’t write as one who has arrived as a guru, but as an ordinary Christian man with many responsibilities. Yet, the extent of his work makes him credible to write such a great book. He doesn’t reinvent the wheel, but gives a blueprint along with the right tools to build the wheel. Productivity is effectively stewarding your gifts, talents, time, energy, and enthusiasm for the good of others and the glory of God. Productivity calls you to direct your whole life at this great goal of bringing glory to God by doing good for others. This call involves using your gifts, the spiritual gifts you were given when the Lord saved you; it involves deploying your talents, those areas of natural strength; it involves managing your time, those 24 hours God gives you each day; it involves making use of your energy, the strength or vitality that ebbs and flows through the day and the week; and it even involves your enthusiasm, the passion and interest you can bring to those works you love to do. God calls you to take all of that and to apply it carefully, faithfully, and consistently to the great goal of doing good to others. Challies’ aim is to change the way you think about productivity and help you take on God’s call to a well-managed life in doing good for others for the glory of God. This is not about getting more done at the workplace—where most writers spend their time—but about structuring and organizing your life so that you can do more good for others and thus bring glory to God. It is about your whole person being productive unto God for His glory. Challies begins by laying a theological foundation with essential questions regarding our purpose on earth and biblical productivity. He then introduces the root of our lack of productivity, the call to godly character, and the call to productivity. The rest of the seven chapters—and the bulk of the book—deals with our responsibilities, mission, tools, and system, the most important and my favorite part of the book. God may call you to do things simply because they need to be done, and he will expect you to do them with joy and excellence. Who knows, he may even spiritually gift you to do them with the highest excellence. As Gene Edward Veith says, ‘Essentially, your vocation is to be found in the place you occupy in the present. A person stuck in a dead-end job may have higher ambitions, but for the moment, that job, however humble, is his vocation. Flipping hamburgers, cleaning hotel rooms, emptying bedpans all have dignity as vocations, spheres of expressing love of neighbor through selfless service, in which God is masked. My favorite thing about Do More Better is the personal and pastoral care with which Challies writes. He doesn’t write as one who has arrived, but as one in the trenches with us. He takes your hand and guides you along. He spends sufficient and brief time laying out a theological framework for productivity—for a lack of productivity is a theological problem—and spends most of his time where no other previous book has, with the tools and system of a godward productive life. Where Perman leaves off, Challies takes over. This was more than valuable to me.